The purpose of this paper is to provide new impetus to the design of strategy and innovation processes in companies. Its intention is to contribute to the discussion of methods of future studies and thereby to increase the practical relevance of future research in businesses. To this end, the specific requirements that these methods have to meet in order to be applicable in companies are presented and recommendations given both for companies and the profession of future research. In every business, there is the need to gain insight into future trends to be able to respond to forthcoming challenges, but it is impossible to identify such trends without attempting to look into the future. As fantastic as it may seem, the application of the methods of future studies actually makes this look into the future possible. However, the use of the methods is often perceived as incompatible with the current workflow. Therefore, this study is primarily concerned with the question of how the methods of future studies can be best applied in business environments. The paper intends to give impetus to the discussion about methods both in the discipline of future studies and in businesses considering the specifics of future studies when applied to the business context. The main goal is to set the stage for improvements of the methodological quality of future studies when applied to businesses and to increase the relevance of future studies to businesses. It aims to supplement the discussion of methods in future research and thereby increase the practical relevance of future research in business. These requirements can serve decision-makers in companies and research to plan and evaluate the methods used to make strategy processes more profitable and efficient. The methodology of this study consisted of a literature analysis, an empirical study and the deduction of theoretical and practical implications. The first step to answer the research questions was to examine the theoretical and conceptual background by means of a literature review. Subsequently, an empirical survey in the form of a preliminary and a main study was carried out. The preliminary study consisted of 15 expert interviews. Then a Delphi study was conducted in two rounds. The results of the empirical survey served to derive the requirements that the methods of future studies would have to meet in companies. Recommendations, both for the discipline of future studies and for companies, on how the methods can be modified so as to meet those requirements were described. The research project was based on the mixed-methods approach with an emphasis on qualitative research. In the preliminary and the main study, different qualitative methods were used. In the main study, quantitative data and qualitative data were triangulated. A total of 204 experts were invited to participate in the study. Of those invitees, 58 took part in the first round of the consultation and 35 in the second round; 32 participants completed the entire survey. The experts chosen to participate in the survey were required to have wide experience in the use of methods of future studies in businesses. The goal was to involve experts with diverse professional backgrounds. Some experts had an academic background in areas of future studies and innovation management, some came from strategy and innovation departments of both SMEs and global corporations, and others from a background in management consulting and research and development departments. The empirical results show that there are specific challenges in applying the methods of future studies in businesses. The methodological design and the implementation of the methods often prove to be difficult. Among the reasons for these problems are lack of knowledge, processes that take too long, limited human and financial resources as well as difficulties in communicating the results. The identification of these problem areas made it possible to derive a set of requirements that the methods of future studies have to meet so as to be applicable to businesses: they have to be easily learnable, transparent, motivational and easily communicable. Further, measurability, the capability to tie in with other methods, the scalability of the method and possibilities for collaboration are important. The methods have to be learnable with reasonable effort at different skill levels because there is often a lack of methodological knowledge in business settings and a knowledge gap between different hierarchical levels. The results of this study also show that there is not only a lack of knowledge about the necessary methodological steps but also uncertainty about the potential insight to be gained by applying the methods. Therefore, both the concepts of the methods applied and the ways in which they can be implemented have to be transparent. It is further necessary that the methods can be transferred both to and from other fields of application. This need arises from the ever-expanding range of methods, from limited human resources and from the diverse intentions that can motivate the use of the methods. The empirical data point to difficulties in motivating the people involved. Since it is crucial to produce and maintain motivation, the methods should satisfy the criteria of being motivational. The communicability of methods is also central in the corporate context. The study shows that there is scepticism about the discipline of future studies and its methods that needs to be addressed. Successful communication can also help to avoid false expectations, which otherwise are often perceived as serious obstacles. Another requirement is the measurability of the process and the outcome. The need arises because many experts believe that it is impossible to verify the outcome of the methods based on “hard data”. The results of the study show that many experts for this reason emphasise the value of the process itself. The empirical data show that the period for the implementation and evaluation of the methods is often perceived as being too long. This suggests that there is a need for temporal scalability. The length of the implementation period, and thus the costs, must be adaptable to the actual situation of the companies. Further, the methods should allow for joint implementation since knowledge from within the company has to be extracted and made explicit. The study reveals hurdles in this process; the involvement of all stakeholders is perceived to be difficult. An essential point of concern is the complexity of the research object, which requires that the chosen methods can be combined. The empirical evidence suggests that stakeholder participation is already used by many, but the potential is not yet exhausted in some places. The study revealed a number of problem areas in the use of the methods. These problems can only be solved through a joint effort on part of the profession of future research and the companies. Focusing on methods only may prevent us from perceiving the limitations but also the opportunities in applying them in certain settings or situations. Therefore, the use of the methods can only be improved if we consider the specific requirements of the companies in question. On the other hand, looking at the operational procedures in a company only may in turn prevent the emergence of new perspectives. Concentration on daily routines may lead to ignorance of the world outside the company and therefore to missing new opportunities. A joint process of developing and adapting methodology could result in devising methods capable of transferring and integrating knowledge and research results about the future instead of creating an abstract “methodology of future research”. The study allowed to derive suggestions for a potentially successful joint working process. How Can the Hurdles Be Overcome? The members of the profession need both strong methodological and excellent teaching skills to facilitate the learning of the methods. The methods of future research should be taught in different contexts: in higher education as well as in vocational training and further education programs at various skill levels. Companies should identify the knowledge gaps of their employees in order to address these specifically. In order to achieve transparency, it is necessary to disclose the processes involved and the criteria used for choosing a particular method. To satisfy this requirement in a company, it is possible to focus on internal transparency so that internal company knowledge does not have to be exposed to outsiders. Practitioners of future studies need to be proficient in interdisciplinary and interface skills to promote the transfer of methods both from and to other fields of application. In addition, an intensive exchange between future studies, related disciplines and companies is very important. Expert knowledge about motivation is needed to motivate those involved in the use of future studies methods. Both the profession of future studies and the companies have to recognise the importance of motivation for the methodological process. Further, companies should enhance social and career-enhancing incentives to motivate employees involved in foresight processes. The basis for the successful communication of the methods is a high level of expertise and communication skills of the practitioners of future studies. This includes both verbal communication itself and communication about communication formats. In addition, the professional management of expectations and individual communication concepts are important in dealing with stakeholders in the company. Knowledge about evaluation concepts as used in the profession of future studies is necessary to be able to assess and measure the outcome. Reviewing the steps taken should be a natural part of every project. To be able to do so, businesses need to make structural adjustments such as define responsibilities and plan a budget for foresight processes. To make sure that methods can tie in with each other, it is necessary to be open to experimentation, extend the combination of methods and also to evaluate systematically. should be integrated in methods that have been unsuitable for collaboration so far. Solid knowledge of project management is essential to be able to assure the temporal scalability of the methods. Therefore, practitioners of future studies need to be able to acquire such knowledge during their training. The profession should also actively participate in the discussion of how to adapt the time scale of the methods. A key aspect to improve the handling of methods could be the application of appropriate software solutions. Whether such a thing as methods of future studies even exists is an issue that is still discussed controversially within the discipline of future studies. The lack of a scientific consensus both on the methodological canon and the classification of methods is responsible for the fact that this study could only provide a limited view on the application of methods of future studies in companies. It is impossible to presume that all participants of the preliminary and the main study would share a common understanding of the term “methods of future research”. Therefore, the range of existing methods is only inadequately presented and quantified. The sample of this study is subject to restrictions: the fact that the participating experts were selected with a focus on their experience in strategy and foresight processes may potentially distort the picture. The reality of those companies that do not deal with strategy at all is not represented in this study either; hence the need for further research. The companies’ reasons for having only little contact with future studies or no contact at all have to be understood. This would be an addition to the results of the present study and might reflect even better on the individual perspectives of different protagonists. Download EFP Brief No. 239_Corporate Foresight – A Delphi Study. This methodology brief describes a procedure where we combine scenarios that allow us to anticipate and prepare for multiple futures with the process of roadmapping serving as a systematic decision support tool. This specific foresight exercise, from scenarios to roadmapping, can be conducted as a one to two-day workshop with 20-30 lead engineers or managers to gather information in an organisation. Managing technologies and strategic planning of business development goes hand in hand in today’s knowledge economy. Business planning in the long run involves planning of emerging technologies as well as anticipating and preparing for disruptive change in economy and society. This involves tremendous uncertainties. Both scenarios and roadmapping are flexible tools fitted to deal with uncertainties. Scenario-making is one way of anticipating possible futures to make better decisions today. Yet, scenarios leave us with many plausible futures, thereby making it difficult to choose which path to follow as each scenario projects a storyline with emphasis on different drivers and ridden with uncertainties. Traditionally, scenarios have been developed to support the formulation of a vision and mission statement for the most desired path of development. However, scenarios have been criticised for being too distant to support strategy development. Roadmapping, on the other hand, is a very precise tool oriented towards decision-making in the present, but it may exclude important uncertainties as the focus is on one single future. The roadmap is a way to illustrate and communicate alignments of technology, product development and market requirements and the right timing guided by a common vision (Phaal et al., 2004 and 2009). Technology management literature defines it as visualising the strategy and showing the route from the current situation to the desired future (Goenaga and Phaal, 2009). In general, roadmapping is described as a structural, yet flexible tool when navigating in a sea of uncertainties. However, we claim there is a weak point in roadmapping not dealt with in foresight or roadmapping literature, namely where the vision comes from. The reason could be that technology roadmapping so far has mostly been part of technology management where the vision is given. This may stand in opposition to strategic management where the vision is developed. For sure, a shared vision is a strong driver for any process. The vision may be developed by top management, but in organisations it is important to actually make it a shared vision leading to shared actions (eventually a driver for the mission statement). While participatory scenario-making provides visions for multiple futures, a roadmap operates with one vision only. In this paper, we propose combining the flexibility of multiple visions of scenarios with action-oriented roadmapping. Only a few previous studies in foresight have dealt with the practical side of linking scenarios with roadmapping. Lizaso and Reger’s article from 2004 provides a theoretical discussion of the value of linking roadmapping with scenarios for strategic technology planning. They describe a step-by-step process of creating scenarios to open up a variety of possible futures. However, they also perceive visions as desirable pictures of conceivable futures. Yet this is not necessarily so. 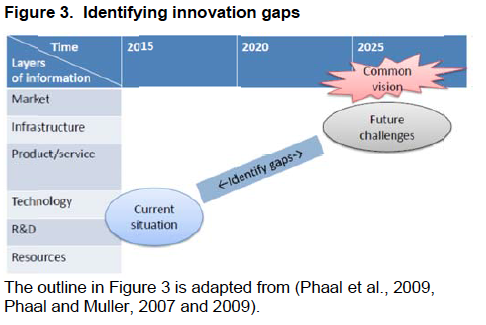 In line with Saritas and Aylen’s article from 2010 that roadmapping usually builds on one future and scenarios on multiple futures, we suggest that combining these methods will add value by exploring possible innovation paths and identifying knowledge gaps and critical decision-points at a given time, thus improving strategy-making. However, in contrast to Saritas and Aylen, who build one roadmap for each scenario, we use the scenarios to develop a common understanding, a common vision, which is a necessary requirement in a corporate setting. 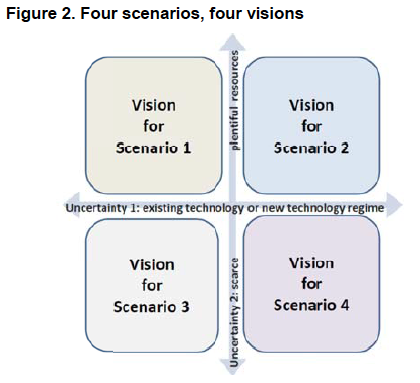 This methodology therefore combines the four scenarios that allow us to anticipate and prepare for multiple futures based on a common vision, which serves as the driver for the roadmapping processes. Linking scenario-making to roadmapping involves moving from an exploratory study of possible futures towards a more goal-oriented strategic roadmap – meaning in this case that the scenario exercise is a playground for building visions. Our point of departure is a group of lead engineers, technology managers or a division of a company – public or private – involved in exploring innovation and future developments (20-30 persons). The group has some insight in the present strategies of a company and the challenges it faces. The STEEPV acronym for the six themes of thinking about the future, social, technology, economics, ecology, politics and values, guides the search for future uncertainties (Loveridge, 2002; id. and Saritas, 2009). Examples are climate change, new technologies, political change and policy drivers, scarce resources (e.g. oil, gas and minerals), economic crisis, and social factors, such as demographic change, change in access to skilled staff, costumer needs etc. We use the STEEPV themes for trends and drivers up to 2025 to facilitate the construction of four future scenarios. 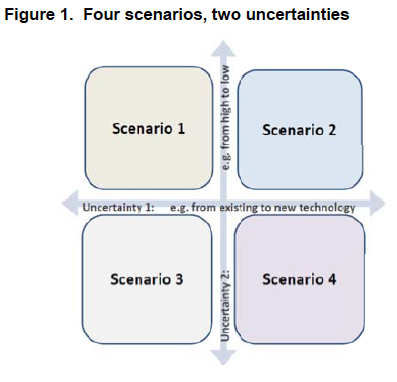 The scenarios are constructed based on two identified uncertainties and a number of market drivers (Figure 1). Which set of multiple futures might be likely? How can the company prepare for them? The exercise divides the participants into four groups, a group for each scenario. The task is to give the scenario a name and formulate a short narrative formulated into a vision. A vision is explained as a desired picture of the company’s position in each scenario given the uncertainties. Figure 2 illustrates the results. The next step is to synthesise the four visions into one common vision for the following participatory technology roadmapping exercise to build upon. Based on the four scenarios, the participants develop a common vision for the firm to meet the challenges envisaged up to 2025. The common vision exercise provides a bridge from the four scenarios to the explorative roadmapping process. It is based on a consensus process integrating the four visions from the scenarios into one shared vision. The common vision acts as the driver in the technology roadmapping process and provides guidance toward the desired future. The group is then introduced to roadmapping, moving from an explorative strategic landscape towards a more goal-oriented technology roadmap. In plenum, the group is presented with a framework of the strategic landscape. The participants again apply the STEEPV themes, but this time they have a common vision and a timeline. The common vision is placed in the framework to highlight the common direction. Post-its are placed along the timeline from the present up to 2025, aligning the layers as illustrated in Figure 3 and 4. Brief comments and discussion are welcomed as the post-its are placed along the layers. The information gathered using the post-its from the previous exercise is condensed into the plenum roadmap, and specific issues or new innovation ideas are placed, discussed and eventually ranked by each participant, placing a red dot on the most important ideas to be explored using the roadmap framework. In our exercise, five technology roadmaps were developed, as there were five groups, providing five new ideas and five development paths for each idea or issue, which were in line with the common vision. The common vision should be seen as the key driver in the innovation process. 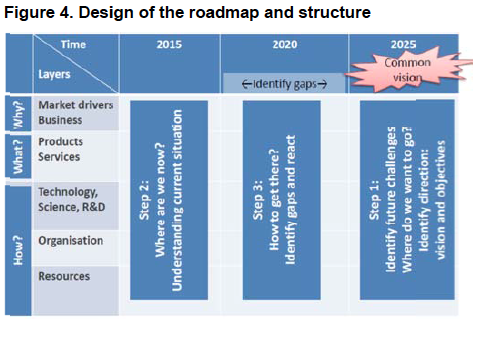 In general, the roadmap provides a visual representation of layers of information related to developments of technologies in the context explored. The focus on condensing the complex information into one graphical framework is a key benefit of technology roadmaps, allowing to visualise market pull and technology push while checking for consistency in alignments of market and business drivers with product and services and R&D development to ensure the right timing for entering the market (Goenago-Larranaga and Phaal, 2010). First, we include a brief theoretical introduction to scenario thinking to create awareness among the participants for the social shaping of the future by showing the possibility of equally plausible alternative paths of development. After the introduction follows a brainstorm session. First, each participant produces post-its for trends and drivers up to 2025 using the STEEPV themes as guidance. Thereafter, we conduct collective brainstorming in plenum where all post-its are placed on a large whiteboard. As facilitators, we cluster the post-its according to the STEEPV themes. The participants then vote on the most uncertain and most likely trends and drivers. The plenum consents on two drivers for constructing the scenarios. Using a simple matrix, the plenum constructs a framework for four scenarios up to 2025. Four groups work on constructing a scenario each based on one vision. After the groups present each scenario and their vision, a consensus process in the plenum leads to formulating a consensual vision. The major value of this procedure is building cohesion around this common vision before introducing the roadmap framework. The roadmapping exercise works with two types: strategic landscape and technology roadmapping. The common vision is the driver for the roadmaps since it guides the process towards achieving a desired future. The participants vote to determine the five topics they consider most import to be explored via roadmapping. Five technology roadmaps – one on each topic – are developed in newly formed groups. The roadmaps support identifying current knowledge gaps if the desired future is to be reached. The framework allows the participants to recognise challenges and critical decision-points that one needs be aware of to respond in time to windows of opportunity. The process ends by evaluating the exercises in plenum. 1. Learning from scenario-making: We see scenarios as a creative way of inspiring innovation. The lesson to be learned from the scenarios is that the decisions made in the present are of strategic relevance to the future and thus actually part of shaping it since the long-term future is an open process. We therefore conclude that scenario thinking creates awareness of socially shaping the future by showing the possibility of equally plausible alternative paths of development in industry. 2. Learning point from the roadmap: The point of the roadmap was to provide a strategic framework for aligning market trends and drivers with technology developments and setting priorities for R&D. 3. Combining scenario and roadmapping: The value of combining scenario-building and roadmapping in this exercise is that scenarios allow us to anticipate and prepare for multiple futures while roadmapping enables identifying options for shaping a technology in more than one direction. 4. The strength of a common framework: Our experience from using this guide testifies to the importance of familiarising the participants with the methodology as a flexible framework and exercise. All of the elements are key ingredients to bring together, for instance, lead engineers or stakeholders in an innovation system with the goal of developing a common vision, initiating innovation efforts, and aligning technology and innovation efforts with trends and market drivers in time to be able to effectively respond to market changes and create the right timing for a new technology. Of course, neither roadmapping nor scenarios are silver bullets. Scholars such as Rob Phaal (Phaal et al., 2003) have argued that the true value of roadmapping lies in the on-going process. We very much agree as roadmapping, albeit a strong tool for decision-making, has no miraculous future-telling powers. As practitioners of strategic projects know, uncertainties change and competing or promising technologies sometimes fail to reach market. Linking scenarios with technology roadmapping initiates an exploratory and creative phase aimed at identifying and understanding uncertainties. Scenario-building creates awareness for the possibility of more than one future, each of which is equally plausible. Roadmapping provides a framework for condensing all information into a single map and timeframe – revealing windows of opportunity and thus linking decision-making with alternative futures. The step from scenario-building to technology roadmapping requires creating a common understanding of challenges and establishing a common vision. In exploring possible futures and visions, the participants are exposed to the basic assumption in foresight that the future in 20 years is open and it is possible to sense and seize opportunities and develop new technical and organisational skills or utilise existing ones. An exercise of this kind can be conducted as a one-day workshop. However, we do recommend a two-day workshop since it leaves more time for group work and presentations. The role of the facilitator is of great significance; it is important to keep a positive attitude and perceive the workshop as an interactive learning process. Furthermore, the structured and systematic framework ensures a common context that makes facilitating the process easier. It may even provide a starting point for the participants to establish networks in the future based on this shared learning experience. In conclusion, combining future scenarios and roadmapping can be useful in that the creativity provided by scenarios may help in making better decisions in developing the paths spelled out in the roadmap. Goenaga, J.M., Phaal, R., 2009. Roadmapping Lessons from the Basque Country. Research-Technology Management 52, 9-12. Goenago-Larranaga, J.M., Phaal, R., 2010. Roadmapping in industrial companies: Experience. DYNA-BILBAO 85, 331-340. Lizaso, F., Reger, G., 2004. Linking roadmapping and scenarios as an approach for strategic technology planning. International Journal of Technology Intelligence and Planning. Volume 1, 68-86. Loveridge, D., 2002. The Steepv Acronym and Process: A Clarification, Ideas In Progress. Paper No. 29. PREST, University of Manchester. Loveridge, D., Saritas, O., 2009. Appreciation and Anticipation in the Evolution of the Nano-Field – a Case for Systemic Foresight. Phaal, R., Farrukh, C., Mitchell, R., Probert, D., 2003. Starting-up roadmapping fast. Research-Technology Management 46, 52-58. Phaal, R., Farrukh, C.J.P., Probert, D.R., 2009. Visualising strategy: a classification of graphical roadmap forms. International Journal of Technology Management 47, 286-305. Phaal, R., Farrukh, C.J.P., Probert, D.R., 2004. Technology roadmapping – A planning framework for evolution and revolution. Technological Forecasting and Social Change 71, 5-26. Phaal, R., Muller, G., 2009. An architectural framework for roadmapping: Towards visual strategy. Technological Forecasting and Social Change 76, 39-49. Phaal, R., Muller, G., 2007. Towards visual strategy: An architectural framework for roadmapping. Picmet ’07: Portland International Center for Management of Engineering and Technology, Vols. 1-6, Proceedings, 1584-1592. Saritas, O., Aylen, J., 2010. Using scenarios for roadmapping: The case of clean production. Technological Forecasting and Social Change 77, 1061-1075.